The report found (though we parents already know) that many found the statutory assessment process stressful and difficult due to a lack of information, poor support and the negative attitudes they often encountered. The report highlights the need to look at whether ensuring a more independent and easily accessible assessment system, with transparent decision-making, will deliver a more secure view of a child’s needs and heighten parental confidence. One of these points includes the prospect of direct access to specialist advice for parents so that they can hear from professionals early in the process. All too often, parents’ views are not taken into account. When my youngest son was in Year one, he was the best reader in the class, but couldn’t get to grips with writing at all. I was told he was just ‘young’. Promises of help were never forthcoming and I was left feeling I was making something out of nothing. Over a period of years, I made a nuisance of myself and it turns out he is dyspraxic and has Asperger Syndrome. Imagine, a parent who knows her own child! He is now getting the proper help at an independent special school, something that would never had happened if I wasn’t that annoying parent who always insisted that ‘something needed to be done’. The report found that it was apparent that, in many of the discussions between schools and parents and between local authorities and parents, there was little focus on outcomes for children. Rather the focus was on the type and amount of provision and often on agreeing a number of hours of support from a learning support assistant. I have found that many LEA officers are so concerned about not spending LA budgets that you would think it was coming out of their own pay cheque. They too easily forget that they are supposed to be supporting the child, not zealously guarding the coffers of the Education Department. 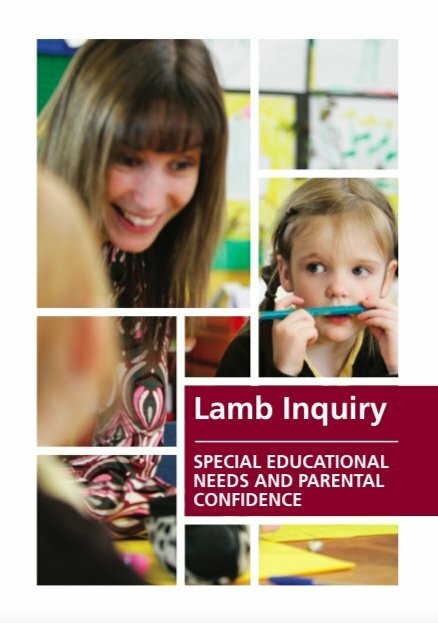 The inquiry found a need for greater confidence that school inspections have an adequate focus on SEN. “A school cannot be a good school unless it caters properly for all the children it is there to serve”. This is a good point – whenever I have looked at Ofsted reports for mainstream schools, the SEN provision is mentioned as rarely as it is in the school’s own prospectus. Another recommendation was that the Local Government Ombudsman can get involved when parents wish to complain about an LEA or school’s SEN provision and that the LGO should alert the Secretary of State where a complaint, or a pattern of complaints, indicates that a particular school or authority is systematically failing to fulfil its duties or is acting unreasonably. Although figures showed that 85 per cent of parents were satisfied with their children’s SEN provision, what this doesn’t reveal is how many of those had to fight tooth and nail to get the provision that their child deserves before they could say they were happy. The inquiry also touched on the need to build Special Needs into teacher training. This is vitally important – it is not useful to dump SEN children into mainstream schools and then not provide the specialist teaching staff to educate them, just assuming they will learn in the same way as everyone else. This is the absolute starting point. A big problem has been delegated funding. Instead of money following the child, it has been delegated to schools who all too often just dump it into the pot rather than make sure that it goes to those children who it is meant to. The report says schools should be told what it is expected to fund and that this is not at present reliably being met. Another issue is the writing of statements themselves. Many are woolly and imprecise, some are just incorrect. This leads the parents into another battle, just to get the wording right – after all, in mainstream school, if the requirements for SEN aren't spelled out, what chance do you have of getting the required provision? Often the statement is cut and pasted from a template, in one case leaving the wrong name at the top of the statement, leaving the impression that the statement writer had no idea what or whom was being written about. The inquiry also recommended that legal aid for parents’ representation at Tribunal should be considered, which is key. Many parents can’t afford the huge solicitor’s bills and are equally unable to represent themselves, whereas the LEA may have a barrister to put their side of the case, if they bother to turn up at all. In fact, through meetings with parents and with the Tribunals Service, the Inquiry heard that some local authorities regularly concede appeals late in the process, sometimes the day before or even on the day of a hearing. This is very common; I know that Hampshire did this in a case recently, the day before the Tribunal, having consistently refused to fund a child at their parent’s chosen special school right up to the last minute, then backing down when it was clear that they had no case. The report recommends that the Tribunals Service should gather and record data on late withdrawals. Another commonly stated parental concern is that the LA has the powers of assessment, employs the professionals doing the assessing and holds the purse strings. This leads to distrust over the independence of the advice. Some LEA Educational Psychologists whose views were sought said it was expected that they will not make specific recommendations, or will not recommend provision that they know the local authority cannot immediately provide. The report stated that professionals should be advising their local authority, or their primary care trust, of shortfalls in provision, not short-changing and recommends that an evaluation of a number of different educational psychology service models is carried out. The impact on outcomes for children and on parental confidence should be a key part of the evaluation. Of course, these are all recommendations and it remains to be seen which, if any, will be taken up by the Secretary of State. But it would be a terrible waste of many, many people’s time Mr Balls, if you didn’t listen to what parents have told you and did something about it. Should children with Asperger Syndrome automatically be statutorily assessed? It all takes so long, so many Children suffer at the hands of ignorant Teachers , though these Teachers think because they are qualified in teaching they know best, yet they are so ignorant of what the child is all about, this type of attitude makes my blood presure rise. My experience at School was a teacher called me thick in front of another teacher and the class, I cried , the Teacher then went out and bought me some chocolate at lunch time no doubt so I wouldnt tell my parents. It has always stayed with me, of course I am far from thick, (though Dyslexic) typically this is an example of how teachers can be ignorant of a childs needs and get it so wrong. My Son may not be an Einstein though Teachers at his present School say he has the brains for all “A” s in his GCSE’s yet the oppotunity woud not have been there if I hadnt have insisted he was Dyslexic and struggling, instead Teachers called him lazy, oh how ignorant they can be and get it so wrong. Hampshire County Council pulled out of my sons tribunal 1 week before the tribunal date. It was the most stressful procedure I had ever been through, and then they just gave in.